On Thanksgiving, we can all use a a few dishes that cook themselves. With the help of a slow cooker, this recipe for sweet potato casserole does just that. With the exception of the marshmallow topping, the entire side dish is prepared in the crock pot. As an added bonus, you will have additional oven space to bake more pie. Step 1: Add water and sweet potatoes to the slow cooker. Cook potatoes for 3 to 4 hours on high or until potatoes are tender. Step 2: Drain sweet potatoes and return back to slow cooker bowl. Add the eggs, vanilla, butter, brown sugar, cinnamon, half and half and salt. Mash sweet potatoes with ingredients until well combined. Continue to cook on high for an additional 1 to 2 hours. Step 3: Preheat oven to broil. Step 4: Remove casserole from slow cooker and transfer to a casserole dish. Top with marshmallows and chopped pecans. 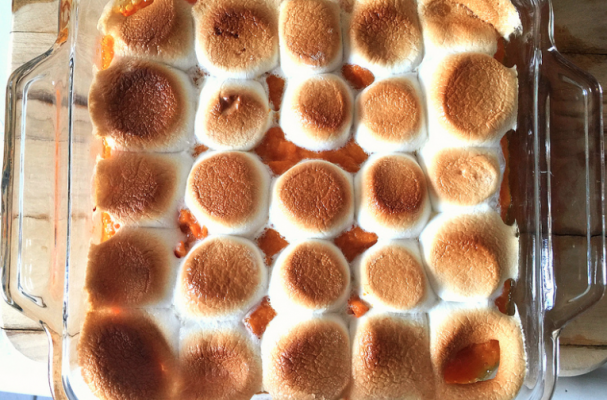 Place in the oven for 2 to 3 minutes or until marshmallows are slightly golden brown.